Happy Birthday to our dear friend Steve Reich! We have had an extraordinary and exciting two years celebrating Steve Reich in a multitude of ways. This past season, in celebration of Steve’s 80th, Russell has been coaching “Music For 18 Musicians” in various parts of the world, we performed with Steve in his iconic “Drumming”and “Clapping Music” here in Toronto and in Soundstreams amazing sell-out concert in Toronto’s Massey Hall with Music for 18 Musicians, and we traveled to New York City to celebrate Steve with SoPercussion. NEXUS was at the Curtis Institute of Music in Fall 2014 working with students on Reich works, and Garry, Russell and Bob were at BAM with the Steve Reich ensemble (Russell and Bob were founding members and Garry joined not long after) for the Nonesuch 50th anniversary where the ensemble shared the stage with Philip Glass, and in 2015 we performed and recorded Garry’s wonderful “Mallet Phase”, a tribute to Steve’s “Piano Phase” played on Garry’s newly-created “Reichphone”. 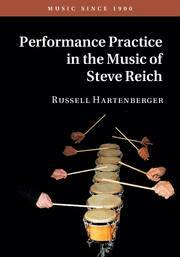 And today, Russell has announced the publication of his book “Performance Practice in the Music of Steve Reich” by Cambridge University Press. The book provides a performer’s perspective on Steve Reich’s compositions from his iconic minimalist work, “Drumming,” to his masterpiece, “Music for 18 Musicians.” It addresses performance issues encountered by the musicians in Reich’s original ensemble and the techniques they developed to bring his compositions to life. We are delighted that Steve himself has provided the Forward. The book will be available soon in hardback and eBook. Happy Birthday, Steve, and many happy returns. Your music has nourished our souls and is a tremendous inspiration. NEXUS and Steve Reich on CBC Radio, Friday, May 14th!